Villa of 160 m with all modern conveniences (3 stars “Gites de France” since 2009), 5 bedrooms, 4 bathrooms and 4 toilets.1 km away from seafront and fine sandy beaches. For 2 to10 persons. Private secured pool (4x9 m) with Roman stairs (perfect for elderly people) and 5 parking spaces if you park the cars right to the gate. Small dogs are allowed. There is a 18-hole golf course 1 km away. Shops and town centre are 1 km away. We are from Saint-Etienne but for professional reasons, we have moved to Sainte-Maxime. We currently live in Cannes, but I personally take care of this house that I’ve called “Villa Marion Paradis”. After various winters of transformation work in the house, we created this beautiful house with character and with a holiday atmosphere where the art of living reigns supreme. It is composed of 5 separated bedrooms and a pool (ground level) and is south exposed and not overlooked. The Villa Marion Paradis is ideally located (1 km away from 18-hole golf course, fine sandy beaches, shops and town centre) in the Pins-Pignons district with view of the hills. You will also find, a bit further in our street, a grocery store, a bar, a restaurant, etc. The tasteful decoration both inside and outside will offer you many possibilities to relax. We are in love with Sainte-Maxime, so we invite you to discover our beautiful region and its market flavours, restaurants, traditions, festivities and above all its quality of life. We are from Saint-Etienne but for professional reasons, we’ve moved to Sainte-Maxime. We currently live in Cannes, but I personally take care of this house that I’ve called “Villa Marion Paradis”. After various winter of transformation work in the house, we created this beautiful house with character and with a holiday atmosphere where art of living reigns supreme. It is compost of 5 separated bedrooms and a pool (ground level). It is south exposed and not overlooked. In love with Sainte-Maxime, we invite you to discover our beautiful region and its markets flavours, restaurants, traditions, festivities and above all its quality of life. 1 Complete bathroom with bath, shower, bidet and 2 washbasins. 3 Shower rooms with shower, washbasin and toilet. 1 Toilet with washbasin. 1 Solar shower for the pool. Total 4: toilets. A single-storey house, there is no extra floor and no basement! There is only a 10 cm stair between the inside of the house and the outdoor terrace. A wonderful villa, just perfect for our two families. The house itself is stunning! Beautiful decor and furniture throughout. Nice kitchen with everything you need and more! We used the outside kitchen which was great. The large pool was amazing and we enjoyed it every day. 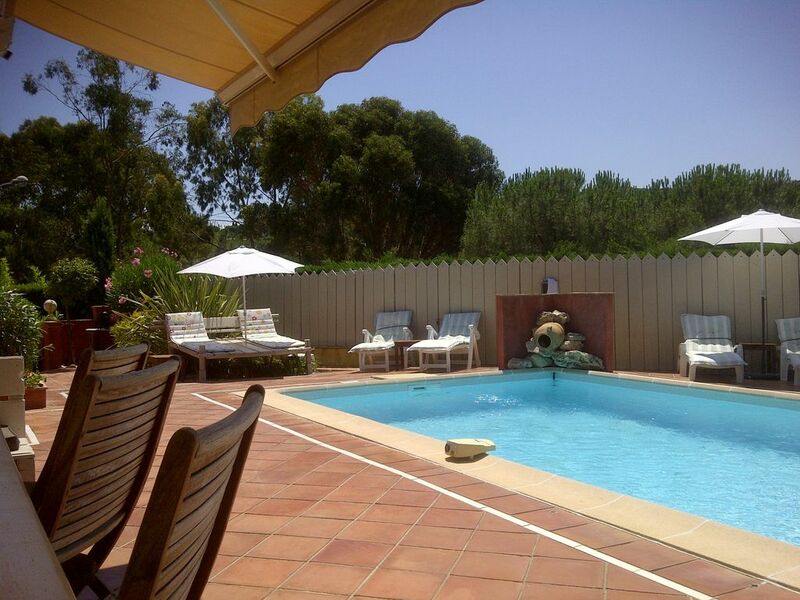 I would definitely recommend this Villa and the owner, Alan was a great host. Nous avons passé une bonne semaine dans la maison de Alain. Le piscine est sympa et la maison bien entretenue et grande. Le coin barbecue est top ! Alain est disponible en cas de problème. Cependant la maison était un tout petit peu loin de la plage et du centre à notre goût, et le rapport qualité prix légèrement élevé. de la plage et 1 km du centre à quelques mètres près .... ça me semble pas très loin ! We had a lovely and relaxing vacation in this nice house. We especially appreciated the poolarea and the outdoor seating. The host was most welcomming and really kind. Nous avons passé un excellent séjour, spacieuse villa tout confort, bien équipée et proche de la mer. Très bien accueillis par le propriétaire et l’épicerie à 50 m est top pour les viennoiseries. Nous y retournerons avec plaisir! Wir hatten die Villa Marion Paradis mit 4 Leuten für 12 Tage gemietet. Die Villa ist grundsätzlich sehr gut aufgeteilt und auch sehr geschmackvoll eingerichtet. Lediglich die Badezimmer sind teilweise sehr klein, vor allem die Duschkabinen darin. Bei der Sauberkeit zur Ankunft hätte man es etwas gründlicher nehmen können, war aber alles im Rahmen des verträglichen. In Sachen Ausstattung hat uns in der Zeit nichts gefehlt, hier hat man wirklich an alles notwendige gedacht - was nicht bei allen Ferienhäusern selbstverständlich ist. Die Lage der Villa ist mit der unweit gelegenen Hauptstraße nicht immer ganz so ruhig, gerade weil in Frankreich die motorisierten Zweiräder scheinbar keinen Limitierungen für die Lautstärke unterliegen. Die Mauern und Bäume um das Grundstück schirmen die Geräusche zwar noch gut ab und machen den Garten gleichzeitig Blickdicht, zu hören ist die Straße aber auf jeden Fall. Das hier aber keine Stille herrscht ist klar, immerhin haben wir uns auch bewusst für die etwas zentralere Lage entschieden. Strand und Ortskern kann man zu Fuß erreichen, man läuft ca. 15 Min bis zu Strand und 20 Min bis in den Hafen. Frisches Baguette gibt es morgens direkt nebenan, gute 50 m entfernt ist ein kleiner Laden. Die Kommunikation und Übergabe mit dem Vermieter lief sehr gut, auch wenn wir alle nicht fließend französisich sprechen. Une maison très propre, Bien équipe! On a passé une belle vacances, c'était comme une rêve ! J'ai veux revenir avec plaisir dans cette endroit ! Merci monsieur !